The innovative and versatile WORX 20V cordless hedge trimmer is designed to make maintaining your hedges faster, easier and more comfortable than ever before. The MAX Lithium battery (sold separately) provides extra-long runtime while being more compact and lightweight – the hedge trimmer weighs in at only about 6 lbs., so you can power through your jobs quickly and easily. Its ergonomic design means less fatigue, improved grip and cutting from any angle. Dual-action, hardened-steel blades reduce vibration and a 9/16-inch cutting diameter trims thick branches and twigs. The aluminum blade cover is rust-proof and easy to clean. 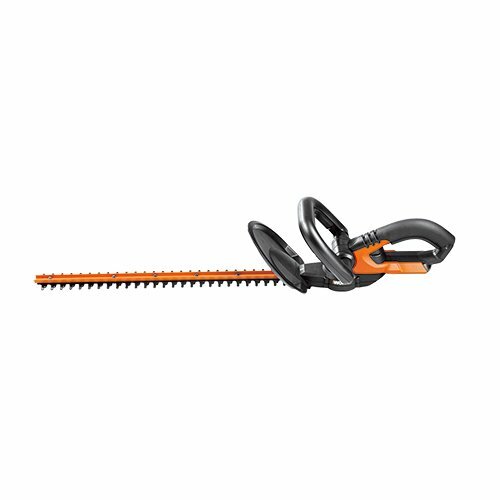 The 20V cordless hedge trimmer delivers true portability and no more dealing with annoying tangled cords while trimming. Tool Only. Share batteries across all your 20V Power Share WORX tools so you never run out of power! By Craftsman Stanley Black & Decker, Inc.